The winner of our 15th Anniversary Photo Contest is Fritz! Fritz has been on quite a journey. 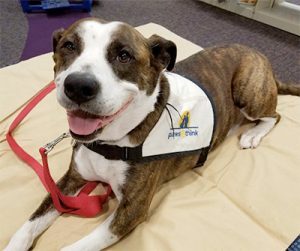 Adopted by Mary Bennett from Indianapolis Animal Care & Control, the Staffordshire Terrier/Bulldog mix became a Paws & Think therapy dog, and now he has just won the #pawsandthink15 photo contest! And Fritz doesn’t stop at just loving people. He loves spending time with other dogs and cats – and even loves going to the vet! So, does Fritz have any other surprises up his sleeve? “He doesn’t have a large repertoire of tricks, but he does love to give people high fives,” Mary says. Well Fritz, in honor of our 15th anniversary, here is a virtual high-five to commemorate your victory! Congratulations!